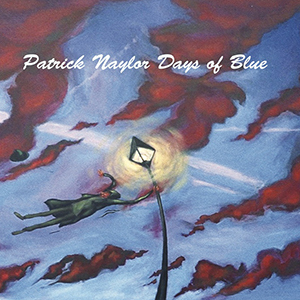 THE FIRST album under his own name for a decade, guitarist/composer Patrick Naylor presents Days of Blue – a bright and breezy collection of original music which, in collaboration with favourite instrumentalists and vocalists, comprises easy-flowing contemporary jazz imbued with soundtrack, folk and world music. As an experienced session musician, band leader, educator, and also writer for film, television and BBC Radio, Naylor is adept at distilling these influences into an accessible sequence of ten numbers which gleam with a variety of hues and atmospheres. And whilst he is clearly an accomplished soloist and leader, this is far from an out-and-out ‘guitarist’s album’, but rather a varied, balanced and articulate jazz experience. Opening with a lively raga feel, Baba flutters to Naylor’s rapid sitar-like guitar phrases, shared with alto sax – a TV theme soundworld full of mystery and conundrum (reminiscent of Christopher Gunning or George Fenton); and Naggar, the first of two vocal numbers, relaxes into Carpenters-style mellowness, Stephanie O’Brien’s clear, genial delivery enriched by atmospheric cello and accordion. The tenor-and-guitar impudence of Rifferama rolls to peppy drums and percussion, revealing both Patrick Naylor’s and Ian East’s improvisational composure – a tidy, chirpy outing; and warm, Jobimesque title track Days of Blue eases along to Sara Mitra’s dreamy vocals, blithe cello and ornamented feel-good acoustic guitar. Initially dark and inquiring, the nine-minute major/minor expanse of Blue Morning opens out to showcase Patrick Naylor’s electric guitar prowess, his infectious bluesy groove sitting somewhere Mark Knopfler and BB King – and, along with David Beebee’s deliciously sleek Rhodes and Ian East’s cool, mode-exploring tenor, this becomes an irresistible standout. Waiting again displays that signature penchant for soundtrack, East’s soprano sax creating a deliciously wistful yet subtly tensile mood; and the edgy Latin pulse of Restless features deft, animated piano and beautifully-toned, Frisellian guitar soloing. The prominent tenor assurance in Lost Song and After Dark is reminiscent of British saxophonist Tim Garland, as Naylor’s precise, softly-resonant guitar in the latter evokes the late, hazy afterglow of Summer evenings; and Vamp hints at late ’70s prog as grittier, sustained electric guitar (with echoes of Steve Hackett) weaves its way through Milo Fell’s colourful, open percussion. An enjoyable album of measured congeniality rather than groundbreaking revelation – recorded and mixed by the renowned Derek Nash – Days of Blue is now available to purchase at Jazz CDs or Bandcamp (take a listen there).